Kawartha Controls is on the forefront of the new wave of robotized manufacturing and environmentally conscious enterprises. We are a part of the low carbon economy and adhere to the Triple Bottom Line (TBL) framework (social, environmental and financial) to evaluate our performance in a broader context. We strive to be both competitive and socio-environmentally conscious where environmental sustainability trumps profitability. 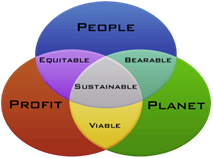 To ensure accountably, we adhere to the Triple Bottom Line (TBL) framework (social, environmental and financial).Our mission is to raise the bar of innovative Hydraulic from the simplest 2 port header junction return manifold block to fully profiled 5-axis pump, motor covers and cylinder components, eco-manufacturing technologies and socially responsible business practices and to lead by example in reducing the overall negative impacts of the hydraulics and overall manufacturing industry. Our goal is to create opportunities for employees to build prosperous, happy, healthy lives built on a foundation of trust and integrity. As a part of our TBL framework, all employees benefit from a corporate stock ownership plan. We are all accountable for ensuring your orders are accurate, in spec , delivered on time and environmental impacts have been minimized. Streamlined workflow process via an integrated parametric ERP/CAD/CAM and data management system to ensure a cost effective, reliable and robust block design and manufacturing process. Data Driven Manufacturing Process, Part of industry 4.0 (4th industrial revolution/“smart-factories”). Innovative and rapidly growing product offering of (off-the-shelf) standard fluid power products. All product manufactured on Full 5 axis machinery ensuring maximum work efficiency, accuracy and repeatable quality. Fully detailed 3D drawing models INCLUDING cartridge valve internal geometry / design are supplied for all proprietary custom designs. YOU own the design IP, do so as you wish. Metric units used for Hydraulic Components Design and Manufacturing operations.